Storage cages, also known as warehouse Butterfly cage, foldable storage cage, cages, and folding Butterfly cage, with storage capacity fixed, stacked at a glance, easy to clean, store inventory, and other advantages, but also to increase the effective utilization of warehouse space. In addition, the product is durable, convenient transportation, reuse, can effectively reduce storage of human consumption and packaging costs. This product can be used not only for factory workshop, and for supermarket display promotions and warehouse. Improved storage cages can be placed on the shelf, line, or stacking: storage cage with wheels can be used in workshops to facilitate fast turnaround, with PVC panels or iron mesh prevents small pieces missing. 1. Made of high quality steel cold-rolled hardened welded together, the intensity is high, large load capacity. 2. Specifications, fixed capacity, storage of goods at a glance, easy to inventory. 3. Zinc plated, beautiful and antioxidant, and long service life. 4. Use of international standards, can be used with containers, improve space utilization. 5. Can be stacked four high with each other to achieve stereo store. 6. Surface treatment, health immunizations, working capital, storage recovery does not pollute the environment. 7. Combined with forklifts, cattle, lifts, cranes and other equipment for efficient operation. 8. Folding structure, cost recovery is low, are alternatives to wooden crates. 9.Can install the wheels at the bottom, internal flow is extremely convenient. 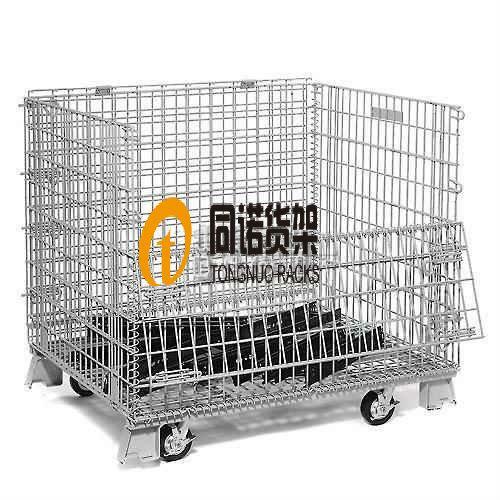 Foldable storage cage: has the storage capacity fixed, stacked at a glance, easy to clean, store inventory, and other advantages, but also to increase the effective utilization of warehouse space. American storage cage: United States-style storage cage, also known as European-style storage cage, compared with domestic storage cage, feet are not the same, and feet made of strong steel. National General is the use of sheet metal stamping. You view the storage cage pictures. Mesh is the main raw material of high line pull strength of steel wire, wire diameter is 5mm, 6.4mm. Mesh welding mesh spacing is normally 50x100,100x100,50x50. Storage cages using u-type steel welded together at the bottom, u-beam rolling and cold rolling strip mill, corners of the bottom punch a punching.